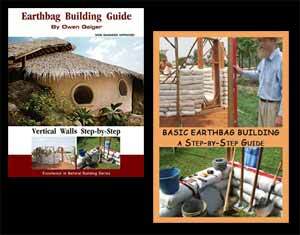 We have added a new feature to www.earthbagbuilding.com: videos! Once we realized how many really informative and entertaining short video programs can be viewed through YouTube.com, we did a thorough scouring of related titles to select only the best for our website. While there are some videos that are merely promotional in nature, or are so poorly produced they are distracting, there are many others that are quite worthwhile. These videos were made in various places around the world, and emphasize how much earthbag building has been embraced by people everywhere. Several of the videos describe the work done at CalEarth with Nader Khalili, and you sense the charisma and genius of this innovator. Another video, made in Canada, shows the building of an earthbag vault that eventually collapses, demonstrating how important it is to make sure that the engineering is sound, even for small projects. So we encourage you to access this new feature, sit back, and enjoy the show! That’s too bad that they decided to remove the video, because it was good for learning what not to do. Basically, what they attempted was to construct an earthbag vault, maybe 12 feet wide, by first making a vault form with some 6″ X 6″ wire mesh. Then they started laying bags up against this form. As I watched, I could sense impending doom. They got up about half way before the weight of the bags overcame the ability of the wire form to hold them there, and it collapsed. Even if they had succeeded in creating the vault, I feel it would have been questionable in longevity, since such vaults are difficult to achieve with earthbags, except for much narrower ones. First I’d like to say great blog, lots of very interesting stuff. Have been reading all the posts. It seems the video of the Canadian earthbag vault that collapsed has been removed by its owner. Which is unfortunate as there is often a lot more to be learned mistakes. Is it hosted anywhere else besides Youtube? If not do you know what they did wrong?